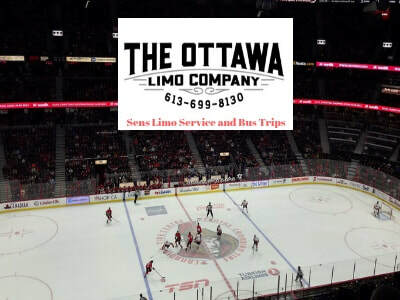 ﻿﻿﻿Book a Limo to the Ottawa Senators Game! Ready for a SENsational experience? Look, we all love our Sens and we love watching them live, but getting to Canadian Tire Centre (formerly know as Scotiabank Place, formerly known as Corel Centre, formerly known as The Palladium) can be a real hassle. Located 20 minutes west of Downtown Ottawa in Kanata, the arena can be difficult to get to, so let us take care of all that for you. Ride in style to support your Sens in our luxurious, comfortable limos. We'll pick you and your party up at your doorsteps and bring you right to the arena, so you don't have to worry about anything except pregaming properly for the big game. Of course, we'll also be there to pick you up right after the Sens win! And because you don't have to worry about getting home, feel free to let your freak flag fly and show your Sens spirit. Shout for Stone! Get down for Duchene! Crush a few for Ceci! Yes, the Ottawa Senators may be going through a rebuild, but we believe in the young players rising up and surprising. Regardless how the team is doing, Senators game are one of the funnest events you can go to in the Ottawa area. You can't beat the atmosphere of a professional hockey game in Canada!